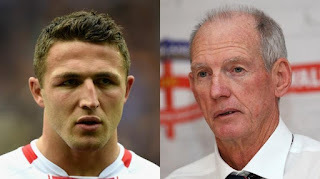 England coach Wayne Bennett has taken aim at the 'inability' of his players to step up on big occasions after his side was dumped from the Four Nations following a 36-18 loss to Australia. The match capped off a frustrating tournament for the hosts, who also lost by one point to New Zealand and were unconvincing against minnows Scotland. "The problem is our inability to continually maintain pressure . . . England are very capable of being a lot better than they are right now," Bennett said. The super coach bemoaned habits picked up in the Super League as the reason for England's inferiority. "Until we get these little problems out of the road - manifested by their club football - I have seen that and they get away with it at that level, you can't at this - that's the difference," Bennett said. NRL player and captain Sam Burgess also came under fire for repeated ill discipline. "Sam gives away far too many penalties . . . he needs to change," Bennett said.